Eva Spoerlein. Solmn blessing & dedication of St. Mary's School, Buffalo Grove, Illinois : on the hundredth anniversary of the First Holy Mass in Buffalo Grove, Illinois, celebrated by the Reverend John H. Fortmann, pastor, St. Joseph's Church, Gross Point, Ill. in the fall of 1847. [S11] John J. Weidner, Compiled Birth, Death, 591, 629, 666, 683. [S3] Letter, Dr. Joseph Urban to John Joseph Weidner, 09 Jan 1997. [S11] John J. Weidner, Compiled Birth, Death, 683 "of Bavaria", 591 year only. [S532] 06 Jul 1860 1860 U. S. Census, Arlington Heights, Cook County, Illinois, USA, Wheeling Township, page 154, dwelling 1077, family 1038, 1860 census states she was 51 years old and born in Bavaria. [S872] Mary Weidner, State of Illinois; Department of Public Health - Division of Vital Statistics; Standard Certificate of Death, Birth country only. [S902] Jacob Weidner, Bark Clementine Microfilm, 02 Sep 1851, The ship passenger manifest indicates she was 43 years old at the time of the voyage suggesting she was born in 1808, 104. [S11] John J. Weidner, Compiled Birth, Death, 591 & 629 no date or location. [S11] John J. Weidner, Compiled Birth, Death, 591. 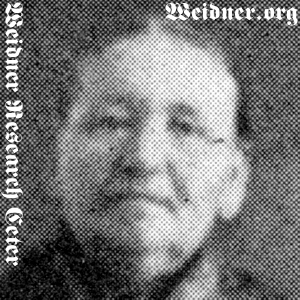 [S11] John J. Weidner, Compiled Birth, Death, 591 date only. [S405] The Cemetery Committee, Vernon Township Cemetery Inscriptions, Lake County, Illinois, 103 location only.